Photograph Lalin Jinasena, of Sri Lanka, captured this fiery photo of The Perahera Festival fire dancers in Kandy, Sri Lanka. This annual procession pays homage to the Sacred Tooth Relic of Lord Buddha, which is housed at the Sri Dalada Maligawa Temple in Kandy for more than 400 years. What a beautiful and creative way to play with fire. I find it fascinating that it require these men to spin their pots around in circle in order for these fire mandalas to exist. 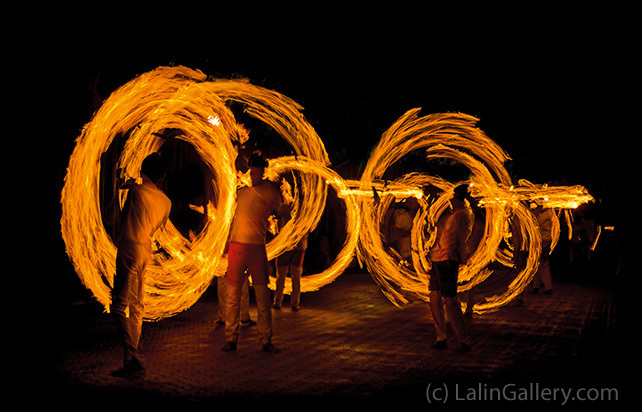 Artist Lalin Jinasena captured moments of breathtaking feats by the Fire Dancers as they encircle themselves in drapes of fire against the black night. Among other Buddhist pilgrims drumming, dancing and brandishing whips, the religious Fire Dancers create a devotional brilliance with enclosing flames, a spectacle rarely seen elsewhere in the world. You can view more of Lalin’s stunning photography via his online gallery. Katherine Parker: Who makes it happen? Tess McGill: I make it happen.